The Angio is an ergometric unit that can be used for leg, arm and supine ergometry. Its compact design makes it universally applicable for ergometric studies in those sectors in which standard cycle ergometry cannot be used. In 2003 the Angio was redesigned and responds to the current requirements, both from the inside and from the outside. The most important changes are the workload range, which has been increased to 7 - 1000 watt and the new, modern design of the ergometer and the workload programmer (Control Unit). From now on, the Angio ergometer can be extended with different modules. 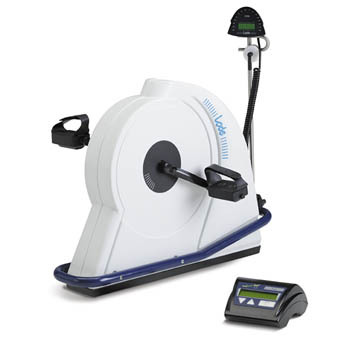 Like the Corival, there is a basic ergometer for which a Programmable Control Unit and a Blood Pressure Module (or a combination of these two modules) are available. Optional Windows-based software provides PC-control and creates custom workouts and graphs and records watts, heart rate and many other variables. Besides the features of the standard Workload Programmer, the programmable control unit has an additional display facing the operator. You have the opportunity to freely programme up to 50 user-defined protocols. Possible programming parameters are: step, ramp, linear, heart rate, torque, repeat and all combinations of these parameters. The programmable control unit can be extended with an infrared port for wireless communication with a PC, laptop or PDA. Using this option you can extend your standard Angio with an accurate stress testing blood pressure monitor with Dimensional K-sound Analysis (DKA), triggered by a TTL pulse from an ECG system or by the optional heart rate receiver. The robust microphone has a double-sided pickup element for increased sensitivity and noise reduction. This module can be controlled by an external device, e.g. ECG system. The name indicates its relationship with Angiography. The Angio ergometer can be used with e.g. Philips or Siemens Angio tables, to which it is easily mounted with the accessory kit, or it can be supplied with the Cardiac Stress Table (Model 17991) that has been designed especially for use with the Angio. Other mounting options, such as wall mounts, are available. Mounted on a table or fixed to a wall, the Angio is the best solution for arm ergometry of e.g. handicapped people (in wheelchairs) or sportsmen (rowers, swimmers). The Angio operates independent of pedaling speed in the range of 7 to 1000 watts. For Communication with ECG devices or PC, both RS232 and analog interfaces come standard with the ergometer. An external control unit has one display showing multiple, user selectable parameters. Angio models are also available for the following environments: nuclear medicine, rehabilitation, radiology and catheterisation labs.